What’s the Difference Between a VoIP vs. Landline System? One of the most important decisions that a business has to make – regardless of whether it’s a small start-up or a large enterprise – is selecting the right phone system. Your business communication system is a critical part of how you do business and can affect every aspect of your organization from employee productivity to customer success. That's why this important decision usually dials down to comparing hosted VoIP vs. landlines. 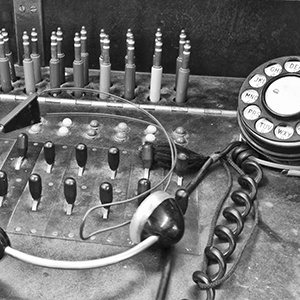 To help you make an informed decision and select what's right for your unique business, we highlight the 4 key differences between hosted VoIP phones and traditional landlines. Landline systems use copper wire connections that plug into the wall and send analog signals through a series of physical switchboxes. Frankly, this technology (if it can still be called that) has been around for well over 100 years, and shows its age in a variety of ways – limited features, restrictions on scalability, high total cost of ownership and more (all of these will be discussed below). VoIP systems, on the other hand, use advanced technology that leverages internet infrastructure (i.e. broadband connection, managed router) to send and receive calls. There are no copper wires and no physical exchanges. All calls are digital and made through certified VoIP phones that are designed to optimize sound quality – often exceeding that offered by landline phones. As noted above, landline systems often have limited features due to the physical limitations imposed by relying on copper wire and physical switchboxes. In some areas of the country, businesses with landline systems have the same limited feature set as residential customers – which typically begin and end with call waiting, caller ID and voicemail. However, VoIP systems aren’t limited by physical hardware – and as such offer a superior range of enhanced features, including: instant messaging, video conferencing, voicemail to text, desktop sharing, calendaring, interactive voice response (IVR), call forwarding and one number service. Of course, these are all in addition to basic features like call waiting, voicemail, call display, call blocking, etc. Scaling either up or down is a problem with landline phones, because a technician typically needs to visit on-site and make changes. This can take time, and it can be costly as well. VoIP systems are inherently scaleable, and as such businesses can add or reduce users easily and very affordably. They can start with as few as 5 users and expand to over 5000. Landline systems charge ongoing maintenance fees, and businesses that have multiple users typically need a private branch exchange (PBX) installed on-site – which costs thousands of dollars. What’s more, businesses must pay for long distance charges, which can easily run into the thousands each year. VoIP systems are dramatically less costly than landline systems, because there are no exchanges, modules, services or circuit packs to purchase, and there are no long distance fees either. All that businesses need to buy are certified VoIP phones and a managed router (i.e. a router designed for business use rather than personal/home use). When you look at the difference between a VoIP vs. landline system, it’s very clear that VoIP offers superior value, flexibility, functionality and of course, affordability and total cost of ownership. To learn more about reaping these rewards in your business, contact Votacall today.